Los Gallardos, Almeria, Andalucia, Spain. Surrounded by rural countryside, Los Gallardos village lies in a wide valley between the Sierra Cabrera mountain range and the hillside village of Bedar in the Sierra de Bedar. 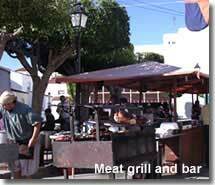 A readily accessible inland destination located directly off the AP-7 motorway from Almeria, less than forty minutes by car from the airport, with many of the regions attractions within easy reach, not least of which are the beach resorts of Mojacar, Garrucha and Vera, all a mere twenty minute drive from the village, and the Cabo de Gata Natural Park just half an hour away. 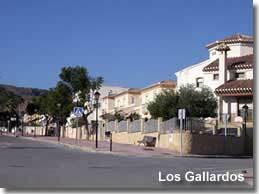 A much sought after area, Los Gallardos is really quite a modern village, with stylish streets of townhouses and villas mingled with terraced rows of traditional flat roofed whitewashed homes that have been here for many many years. 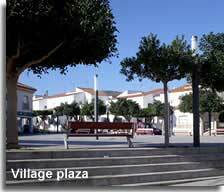 The village has all the amenities of a small town rather than a rural pueblo, besides a local doctors surgery and a dentist, the town hall, school, church and post office, there are numerous cafes, bars and restaurants, many having great terrace spaces for outside relaxation. The local shops, scattered throughout the village streets, include bakers, butchers, fishmongers, mini markets, a chemist, a hardware store, an electrical store, a tabaconist, an accountant, a furniture shop, shoes shops and clothes shops. 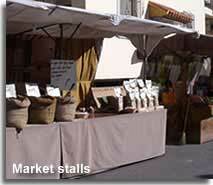 There are two banks and, every Tuesday morning, the local market sets out its stalls offering an array of produce including locally grown fresh fruit and vegetables. This is not a big village so it is quite surprising to find such a good infrastructure of services. 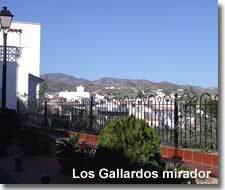 Now, this village is very close to my heart, and if you have already read the ABOUT page of this website, you may well have already guessed that Los Gallardos is my home village, how lucky am I! 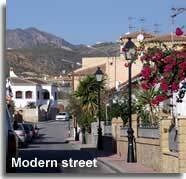 It was May 2006 when I came to live here, after making the decision to relocate to Spain and set up a small business, and I chose this up and coming area as the place to open my community internet shop, which I ran for seven lucky years before closing to concentrate more of my time to this website. I really could not imagine living anywhere else. 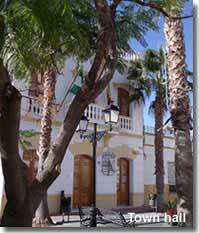 As with most Andalucian villages, Los Gallardos is not without its village square, many fiestas are held in this spot, but generally it is a place to sit, relax and chat with friends. The Mirador of Los Gallardos, located towards the top end of Calle Mayor, just before the town hall square, also has a seating area and offers lovely views over the local countryside towards the hills of Bedar. 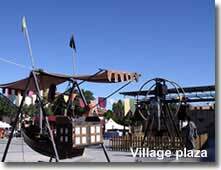 For outside recreation within the village there is a park with a play area for children and along the main road at the forefront of the pueblo there is a selection of exercise equipment for public use. Recent modernisations to the village include a brand new road linking to the sports area which is located on the village outskirts, comprising of a newly improved floodlit football ground, a picnic area complete with tables and benches, a further childrens play area, a summertime outdoor swimming pool and a yet to be opened sports complex. Further improvements comprise of a brand new school, a doctors surgery and medical centre, and a full overhaul of Calle Mayor, the main village street. Although Los Gallardos has seen much construction, making it the village that it is today, it wasn't until the 1900s that it was updated with modern conveniences such as electricity, telephone services, sewer systems, and paved roads. 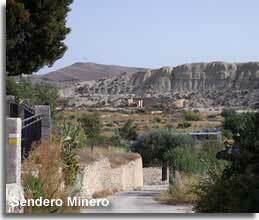 Previous to this, in the 19th century, after iron and lead were discovered in the surrounding hills, Los Gallardos prospered as the mining base between the Sierra de Bedar mines and the port at Garrucha, the two being connected by a railway. 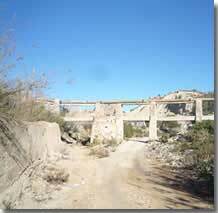 Remains of the old railway bridge can still be seen today and the historical mining heritage of the area can be uncovered on the Sendero Minero walking trail which is signposted from the church plaza. 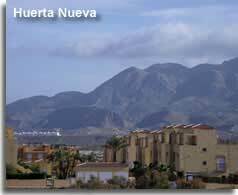 Los Gallardos does have a bus service to the coast, it is actually part of the Los Gallardos to Huercal Overa route, ruta 11, which passes through Turre, Mojacar Pueblo and Mojacar Playa among other destinations. Though the timetable is limited it is an option for a day out on the beach without having to drive, and only costs just over one euro each way. The bus stop is found on the main N-340a road and is easily recognised as it is in fact a traditional bus shelter. Bus timetable from the Autocares Baraza website. 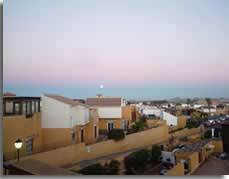 It is not by coincidence that Los Gallardos is home to quite a large number of British expatriates, many are retired, yet there are a good number of younger couples and families that have been attracted to the area. Just outside of the village, yet still within walking distance, is the large urbanisation of Huerta Nueva, a quality housing development of villas, townhouses and apartments, overlooked by the stunning mountains of the Cabrera, a favoured property hot spot for both holiday homes and full time residences, many have chosen to relocate their lives to this well placed luxury complex. 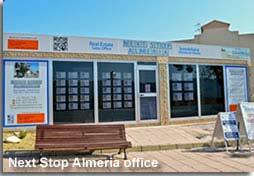 Next Stop Almeria Estate Agency is owned and managed by Los Gallardos local residents Paul Fullard and his wife Diana. Starting out in property management in 2007, they expanded their business to include property sales in 2009 and have not looked back, their extensive property portfolio includes numerous Los Gallardos properties, as well as an ever expanding selection of homes in surrounding areas and beyond. 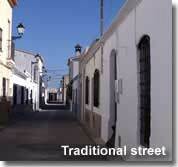 In June 2013 Next Stop Almeria opened their sales office in Los Gallardos, a welcome addition to the village. The office is located along the main paseo that runs along the front length of Los Gallardos village, there you will have the pleasure of meeting Ashley, the newest member of the Next Stop team who has live in Spain from a young age and has fluency in the language. Paul is always on hand to guide you through each and every stage of the buying process, with an after sales service from Diana that goes above and beyond. The oustanding client testamonials that are detailed on the Next Stop website are a clear indication of the Next Stop philosophy to treat others as you would want to be treated and they certainly demostrate that Paul and the team are professional, approachable, and knowledgeable in their field of expertise. 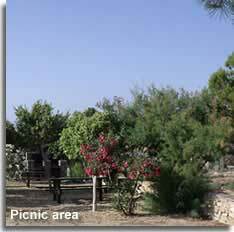 The municipality of Los Gallardos also includes the smaller village of Alfaix which is situated 10km away, amid the rolling Cabrera foothills. Alfaix pueblo has seen recent small scale development and can offer the prospective purchaser further options for property within close proximity to the amenities of its big sister. 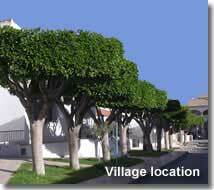 Alfaix is also the setting for the El Pueblito de Alfaix holiday village, a luxury private resort of Moorish style whitewashed villas and apartments set against the dramatic Cabrera mountain backdrop. Huerta Nueva and Alfaix aside, there are properties to be found in Los Gallardos itself and in the surrounding countryside. In England I barely knew my neighbours, yet here in Los Gallardos I have many friends, both English and Spanish that I could call on any time, this is a village with real community spirit. Naturally I am biased, but this really is a lovely place in which to relocate or holiday and the Spanish neighbourhood is ever so relaxed and welcoming. The following three photos and the comments are from Alan and Kris Wessels-Coles, who now live in Los Gallardos, they have very kindly sent an account of their relocation experience to the area. 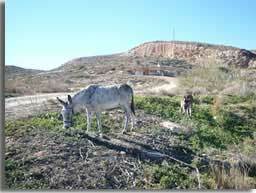 The photos show the local countryside and Huerta Nueva. In the meantime, very many thanks to you and Paul and all the other people we’ve met so far for enticing us to share the area's attractions with you. " Welcome to Los Gallardos Alan and Kris and thank you for your very kind comments and sharing your thoughts, and photos, for others who are considering a similar move. Los Gallardos celebrates several national and local fiestas, as many as it possibly can it seems, including the Dia de Andalucia in February, the Dia de la Vieja around the end of March, the San Isidro fiesta in May, the Corpus Christie in June, and the San Miguel fiesta at the end of September or early October, the exact dates can vary from year to year and can be confirmed with the town hall. 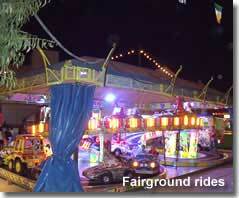 The two main fiestas of the village, however, are the Fiesta de la Virgen del Carmen, a major fun filled festival celebrated round the clock during the summer holiday season in honour of the village patrona, and the Fiesta Los Reyes Magos, a family feista during the Spanish Christmas holiday period. Held in mid July, usually on the closest weekend to the 16th of the month, this fiesta runs for about 4 days, often with an unofficial start on the night before the first day! 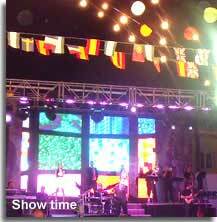 This is a continuous celebration with both day time events and and evening entertainment, with the only lull in the proceedings being between 7am and 1pm, when everyone gets some much needed sleep. The main party time is after the sun goes down, there are fairground rides, street stalls, alfresco bars offering food and drink and the village plaza becomes a dance floor and stage for costumed dance extravaganzas and local music bands, the evening shows tend to start up around 9.30pm and of course go on until the early hours of each morning. The day time Floral parade, in honour of the Virgen del Carmen, is the significant fiesta procession which travels through the village streets between the church and Plaza de Andalucia. 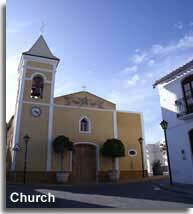 A programme of events is available from the town hall a few days prior to the fiesta. Enjoyed by the whole of the village and many visitors, it really does have to be experienced to be believed, the street lights, the magical atmosphere, the happy faces of families and friends, I will never forget the 'I just cannot believe I live here' feeling from my first Los Gallardos fiesta. 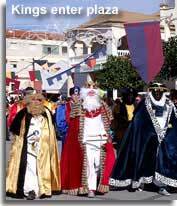 Known as the Fiesta of the Three Kings, this huge family event is the religious celebration of the Epiphany and is rejoiced by many villages, towns and cities throughout Spain, usually on the 5th and 6th of January, the 6th being a national holiday and the day that the Spanish exchange their gifts. The procession of the three kings, usually held on the evening of the 5th of January, involves an elaborate street parade headed by the decorated float of the three kings, Balthazar, Caspar and Melchior, and is followed by a throng of families. Amid music and fireworks, the kings will traditionally throw sweets, and sometimes small presents, into the crowds for the children to catch. In Los Gallardos the Fiesta de los Reyes Magos, usually a two day affair, both daytime and evening, is again centred around the main village square, however this festival sees the plaza transformed into a medieval street fair, including alfresco meat grills, outdoor bars, wooden tables with benches for dining and a medieval market of traditional stalls, complete with their costumed stall holders, selling everything from homemade cakes to art, craft work and jewellery. The market itself really is not to be missed, the stalls offer all sorts of interesting curiosities and the eating venues are fantastic. There really is something about eating alfresco, perhaps its the tantalising aroma of the meats as they cook that start to tempt the taste buds, or even the sight of the food, which is grilled in full display, but somehow the offerings always taste so much more delicious when eaten outside. 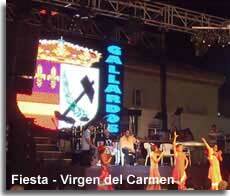 I really cannot recommend this fiesta enough, if you are going to visit Los Gallardos this is a perfect time to do so. 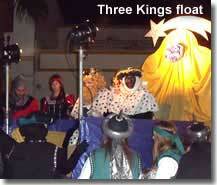 Though proceedings can vary, in general the three kings parade in Los Gallardos occurs early on the first evening of the celebrations. 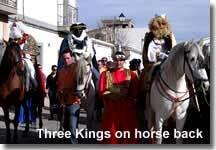 The small float, weighed down with bags of sweets, and of course the three kings, who are usually three selected teenagers from the village all dressed up in their regal costumes, leaves the town hall square and winds its way through the village streets. Accompanied by music and costumed entertainers on stilts, the children of the village make close chase, each one armed with a carrier bag to enable the collection of as many sweets as can be caught. The main celebrations however start on the morning of the 6th, with the festivities in the plaza already underway a second portrayal of the three kings parade is commenced. 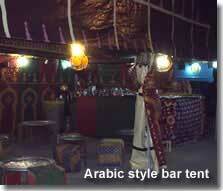 The event involves many of the villagers all dressed up in costume, each one having their own role to play in the dramatisation of the three kings story. 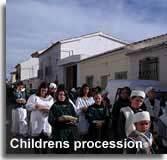 The parade, headed by the children of the pueblo, who are also donning their own special outfits, travels from the town hall down to the main plaza, where King Herod awaits in his makeshift palace. The three kings, now adults and on horse back, are escorted through the village by the guards of King Herod and a large procession of villagers and visitors, the scene is embellished by musicians playing flutes, drums, and guitars. After a few stops en route for role play a dramatic entrance to the main square is made, the three kings enter King Herods palace and the performance runs on to its finale. 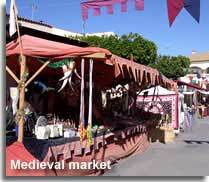 For the rest of the day the village square sees the continuation of the medieval fair and market, with music and dancing and a selection of daytime entertainment for all the family to enjoy, such as acrobats and belly dancing, though this varies every year. 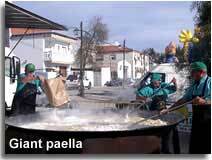 Not to be missed is the Comida Popular, provided by the town hall, there is free food for everyone, usually paella or tortilla, cooked and served outside beside the marquee that also provides free beer and wine for a limited time as an accompaniment to the food. 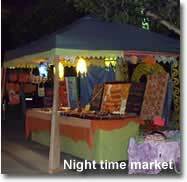 As night time approaches the marquee is the venue for a music and dance extravaganza while outside the plaza offers a buzzing ambience of an olde worlde village, with stalls holders peddling their wares to the contented visitors. 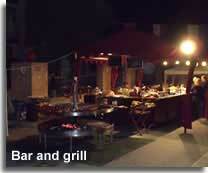 The highlight of the evening has to be the rustic food stalls, warmed by the heat of the tin bin fires and sizzling grills, friends congregate to enjoy the hot freshly cooked food and their favourite tipple while soaking up the festive atmosphere at the end of wonderful family day, the party continues until the last person leaves. A program of events, changeable each year, is available from the town hall a couple of week prior to the fiesta. This is the most amazing, yet low key and relaxing fiesta I have ever been to, a time to enjoy family festivities, eat, drink and spend a few euros on the fabulous market stalls. 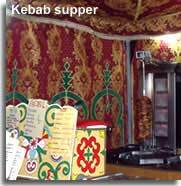 My recommendation for supper, from the tempting selection of hot hearty food, has to be the traditional kebab, with a choice of doner or chicken, served from the kebab tent, it is a perfect way to wind down the indulgences and frivolities of a very special day. One of the things I love about the Spanish fiesta is the fact that although there is much alcohol consumed it is always along with lots of lovely food and it is very rare to see any rowdy drunkenness, even though the celebrations last all day and long into the night. This trail follows the layout of the old mining train of Tres Amigos – Garrucha, a route that connected the mines of Bedar, in the hills above Los Gallardos, to the port at Garrucha, typical railway constructions such as bridges, stores, and stations, are still evident. Leaving Los Gallardos the trail crosses the Pecho de Almendras, the Barranco Martinez ravine, and the Cerro de la Cuesta Tabaquillo hill to the Paraje del Portugues beauty spot. At this point the route divides realising a loop, continuing to the left leaves the old railway line and takes up a pathway that crosses the Pago de Angela Antonia leading to the Paraje de Los Burgos beauty spot. From here, just by the old railway bridge that crosses the Rambla de las Costillas, the trail returns to the railway track and progresses to the starting point of the loop and the return journey to Los Gallardos pueblo. The biological diversity is high along all areas of this trail, emphasising characteristic flora of the Mediterranean climate, in particular there are two endemic species to be encountered, the matamarilla (Helianthemun alypoides) and the romerillo de Sorbas (Teucrium turredanum). Millefloris, a variety of thyme, is considered a local variation of the species and is catalogued as being in danger of extinction. 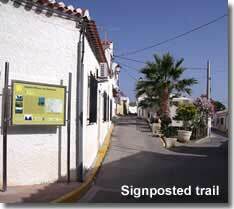 The trail starts in Los Gallardos pueblo, at the top of Calle Mayor, and is signposted from the church square, a map of the route is indicated on the sign.